Yesterday is what I like to call a happy-tasty-masty-Sunday. It's kind of hard to be grumpy when you wake up to the sun shining through the blinds, soft cool sheets on your legs, and the wonderful sound of cars whooshing by outside. [Did she say cars?] Yes, it's LA silly, not Snow White's little cabin in the woods. No matter, it was Sunday, and that means serious food adventure business. First stop: The Farm Mar. My affectionate term for farmer's market, it's become a Sunday classic to walk down the road for our weekly dose of local, and ideally organic, fruits and veggies. Sometimes if I'm good, we get a treat like fresh-squeezed lemonade or crusty artisan bread. But yesterday, we were on a mission: stock the kitchen. Last but not least, we ventured to HK. Han Kook Market is your typical Asian supermarket with an aisle dedicated to miso and seaweed, cheap and fresh produce, and all those delectable specialty prepared foods you can't find at your typical grocery store. We got our bundle of shiitakes, rice noodle wrappers, ban chan, and garlic. Plus we ran over to Paris Baguette to get a French cream loaf so I can try my hand at bread pudding this week. Here's what we ended up making for dinner after our foodventure-filled day! 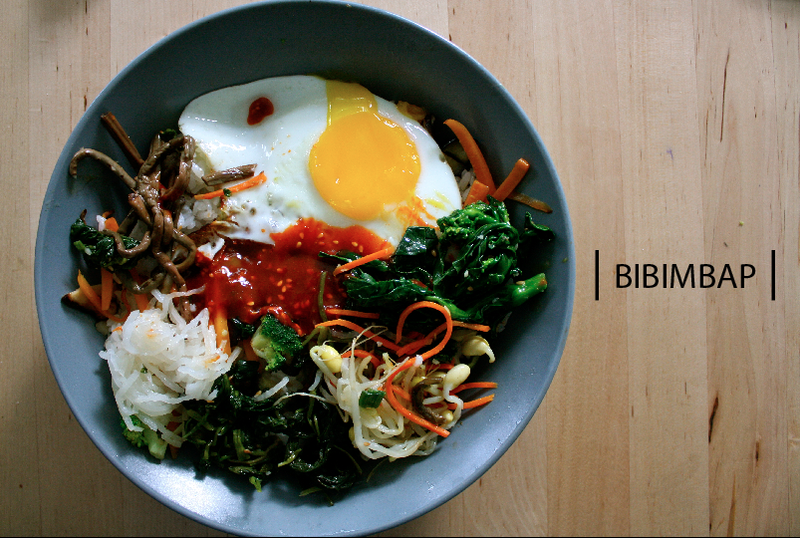 It's called bibimbap, and for those of you that haven't had it, heard of it, don't even know if you want to try and pronounce it, it's not that scary. In fact, it's pretty frickin delicious. 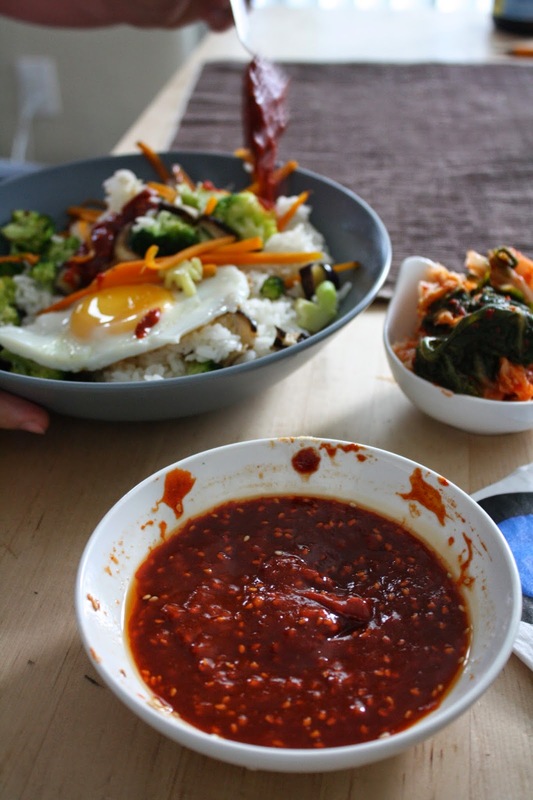 Think of it as a Korean rice bowl, but served in a fiery hot pot that makes your rice sizzle and a red pepper sauce (gochujang) that's kind of like Korean ketchup, only like a thousand times better and spicier and more flavorful than ketchup. 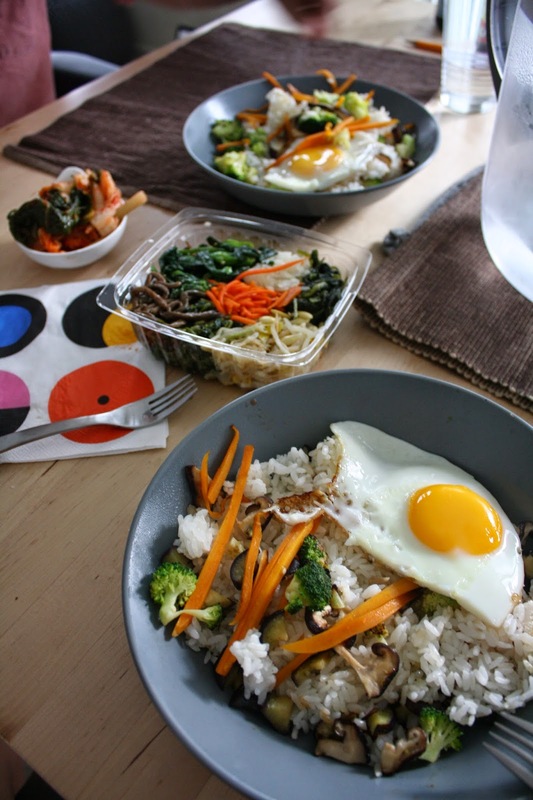 Anywhoo, you can make a whole bunch of varieties to bibimbap and don't need too many special ingredients or equipment. Since I'm vegetarian, I didn't add meat, but I'm convinced it doesn't need it! The mushrooms and egg give it enough body to fill you up. If you don't have the veggies I listed, feel free to choose ones you like and modify as you wish. I'm a firm believer in cooking what you like, so grab what makes you happy and see if it works! Scroll down past the pics for recipe! First, wash rice a few times by filling bowl stirring your hand around and filtering the murky water out. Be careful to not let any precious grains slip through your fingers! Fill with water using the finger trick, or 4 cups and start your rice cooker or cook on the stove. Chop your veggies into bite-sized pieces. For carrots, we liked thinner matchsticks; for eggplant, little triangles. 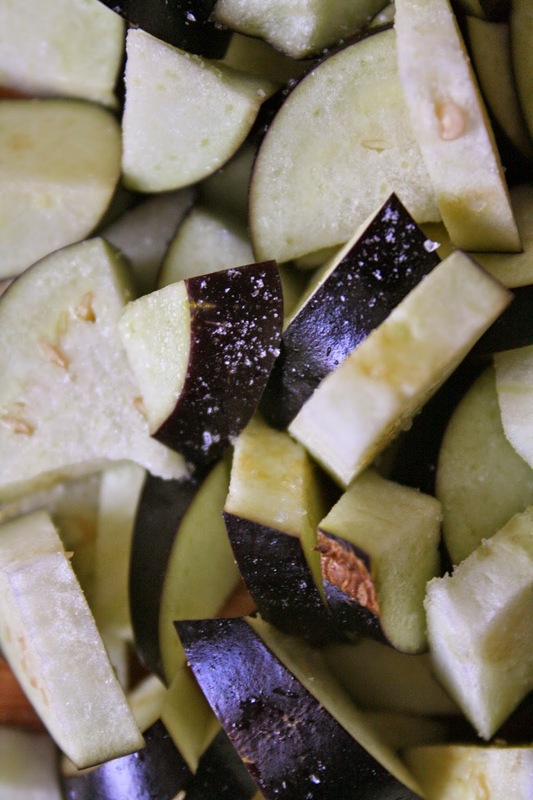 Trick: salt your eggplant to extract the moisture which will allow it to cook and be creamier and absorb more sauce rather than oil. Heat a few teaspoons of canola oil and a dash of sesame (a little goes a long way) in your wok. Add veggies and cook for a few minutes until they begin to soften. Then add hoisin sauce and let cook until veggies are cooked through yet still crunchy. Set aside. In a separate skillet, heat a dash of canola oil on medium-low heat and crack your eggs so they don't touch. Fry the eggs a few minutes, keeping the yolk a little raw (around 5 minutes). When rice is done, add canola oil to empty wok and heat cooked rice. You want to spread it out so more rice gets crispy- we're trying to mimic the way traditional bibimbap crisps in a stone hot pot. Feel free to add your veggies and cooked eggs to the top of the rice to keep them warm. While rice crisps, make the red sauce by combining all the ingredients in a bowl and mixing. When you begin to smell rice toasting (almost like popcorn) turn off your wok, grab your bowl, and serve! Make sure each bowl has rice, veggies, and 1 egg. Then decorate the bowl with a little of each ban chan. Let each person add their sauce to their own dish so they can control the spiciness. ** I bought the little plastic container of ban chan from HK market. 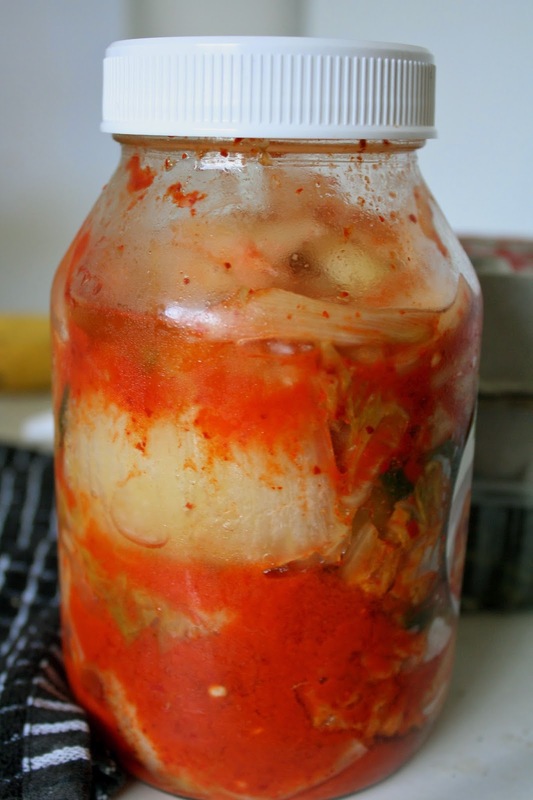 If you don't have a Korean market near you, you can prepare most of these on your own. 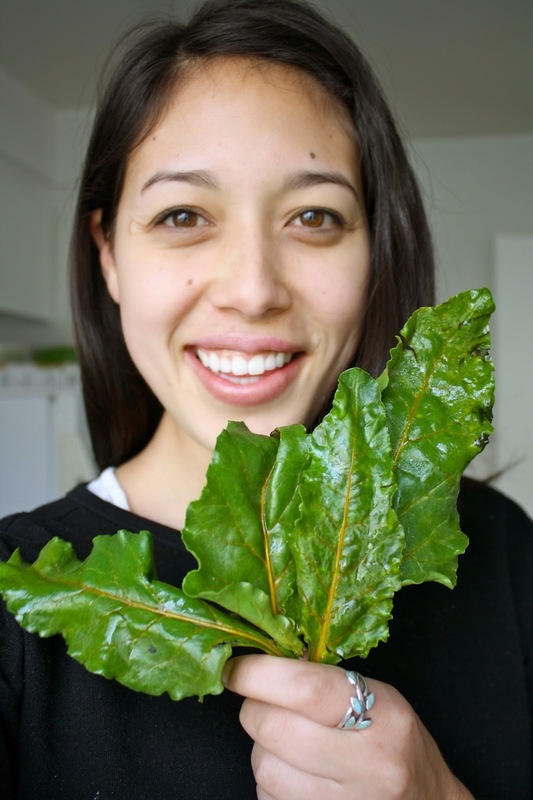 Simply do a quick sauté (3-5 minutes) of spinach and bean sprouts with a little sesame oil, salt, and soy sauce in a hot wok.